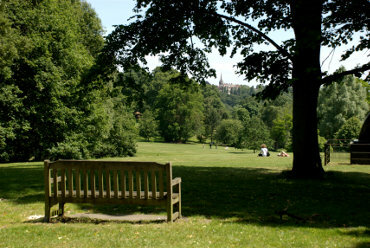 BeenThere-DoneThat: Hampstead Heath (1), London. Hill Garden, owned by the Corporation of London, is a very attractive garden with a remarkable pergola; one of the most extensive pergolas that we have seen. The garden seems to be relatively unknown and there were few people there when we visited which seems extraordinary when entry is free. 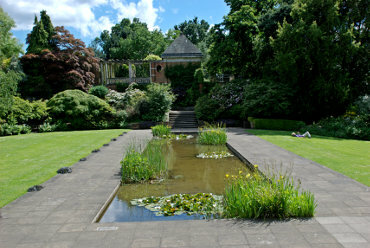 A small part of the pergola can be seen beyond the end of this ornamental pond. 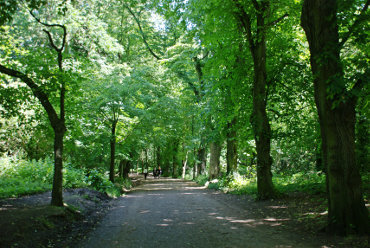 Hampstead Heath is not all open heath but includes plenty of wooded areas such as this; some of it quite undulating. There are plenty of beautiful open views in a variety of habitats such as this parkland. Near the northern boundary of Hampsted Heath is Kenwood House which dates from the 17th century and is seen here across its own grounds which are quite extensive. 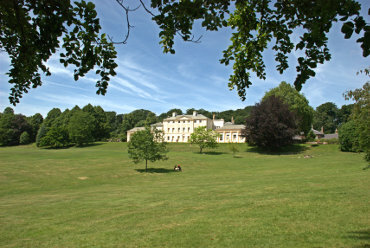 The house and the 74 acre estate are now owned by English Heritage. It is open to the public and entry is free. Read our report of this trip to Hampstead Heath on the Blog.